Kelsey sent me a text message a few months back asking if I would like to make a quilt for our Great Aunt together. I immediately agreed and Kelsey started sending me digital palettes of the most gorgeous shot cottons. After a few back and forth emails, we placed an order (and even sprang for some amazing Oakshott cottons). 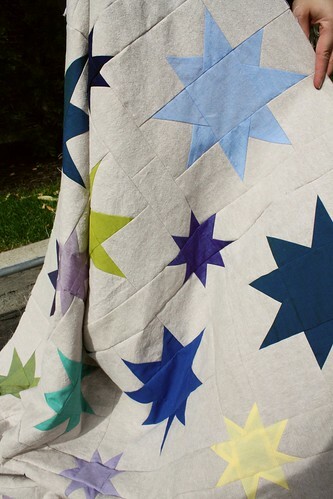 We settled on a wonky star design using this tutorial as inspiration. We divided up the fabric when I was in Calgary back in July and gave each other the homework of making our respective blocks before Sewing Summit so that we could piece them together and have a finished quilt top before the weekend was out. Kelsey, of course, finished her blocks...I started cutting mine the morning before I arrived. I finished my cutting on the first night of open sew and managed to get them all sewn together on the second night. With a little bit of teamwork, the amazing vibe at open sew and the benefit of the communal design wall in the sewing room, we settled on a layout and sewed everything together. We are both really excited about how this turned out. These fabrics definitely glow. We used some Essex yarn dyed linen blend in Flax for our background fabric which added a really interesting texture to this quilt in contrast to the luminescent shot cottons. I couldn't resist this photo of the wrong side. I am really excited to see how Kelsey quilts this. I think it'll make a perfect 90th birthday gift! This is gorgeous, girls!!! 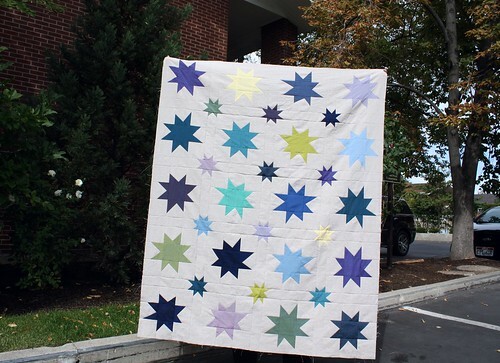 I have a very big soft spot for wonky star quilts - and this one, with the large AND small wonkies in all those amazing colours just may be my fave. 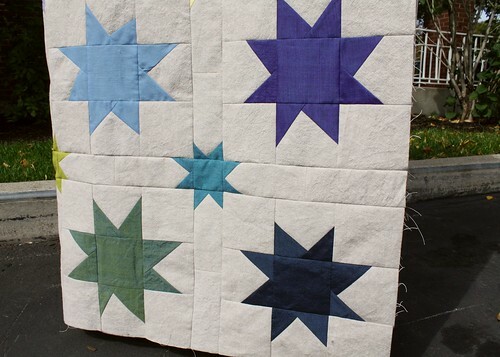 I wonder what Kelsey will come up with for quilting - I expect it will be fabulous! 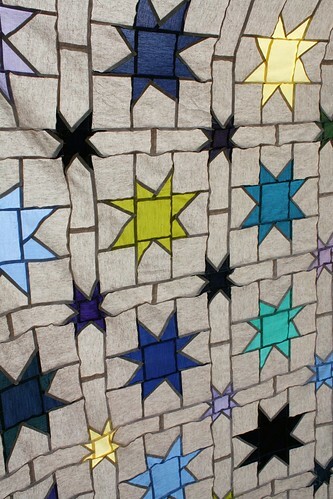 Love the mix of small and big stars and great colors too, beautiful! Sigh, this is really gorgeous! I'm sure your Great Aunt will be thrilled with it. I also can't wait to see how Kelsey quilts it. Linen gets such a great texture with quilting, I'm sure it's just going to make the shot cottons glow even more than they already do. So beautiful. I love your choice of colors. Lovely work as always ladies, can't wait to see it quilted up! Ooh, I just love this! Have pinned it to my quilt inspiration board. Love this! I really like how the regularity of the layout balances the wonkiness of the stars themselves. The perfect % of wonk, in my book! Sorry I'm late to the debut of this quilt top, but now that I see it, I have to say how fab it is! You've balanced the wonky stars so well with the uniform pattern and their colors. I probably would have just used a white background but that Linen colour is so much more inspired an works for this recipient as well! This has such a modern handmade vibe, stellar work! From K - Dressing it Up!